This year's conference of the National Shop Stewards Network (NSSN - conference details below) takes place at a pivotal time for the trade union movement. Recent figures show that union membership and strikes are at historically low levels. The effect on workers is disastrous. We have witnessed the growth of precarious employment through temporary contracts, agency working and increasingly the most parasitic of all, the gig economy. No wonder that wage inequality between bosses and workers is at pre-war levels. The drop in days lost in strike action is partially explained by the introduction last year of the Tory (anti) Trade Union Act. Its undemocratic voting thresholds mean that the unions are the only organisation in society where a simple majority no longer suffices. There would barely be an elected councillor if they had to abide by the same rules! Many union leaders will argue that this means that national strike action is now impossible as at least 50% of union members have to vote. However, they bear the responsibly for not mobilising the full strength of the union movement to defeat the act before it became law. Not one national demonstration was organised by the Trade Union Congress (TUC), merely an indoor rally where not every seat was booked, showing their lack of confidence and seriousness. A serious struggle should have been launched, linking the need to fight this new anti-union law with the Tory austerity offensive that has seen up to a million public sector jobs lost, the NHS and education in crisis and a lost decade for workers' incomes. A mass movement of demonstrations and actions were entirely possible that would have made it impossible for a divided and crisis-ridden Tory government to impose the new law. Over the last 12 years, the NSSN has been able to act as a lever on the union leaders, especially during the public sector pensions struggle of 2011, which culminated in the 2 million-strong strike that November (N30). It shook the government. But when the action was cut short by the TUC and the likes of Unison's Dave Prentis, the Tories were able to unload their brutal cuts. The NSSN had campaigned for mass co-ordinated strike action and N30 was effectively a public sector general strike. 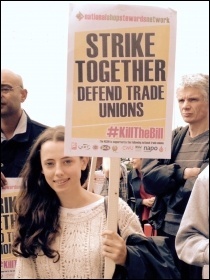 The NSSN then worked alongside PCS Left Unity when it called a conference of the union left of over 500 activists and reps in early 2012 to attempt to retrieve the strikes. The movement of 2011 was kicked off by the mammoth 26 March TUC demonstration of 750,000 workers. In May this year, perhaps less than 30,000 took part in the TUC 'new deal for workers' march. But this is in no way because of a decrease in workers' anger or frustration over the last seven years - quite the opposite! 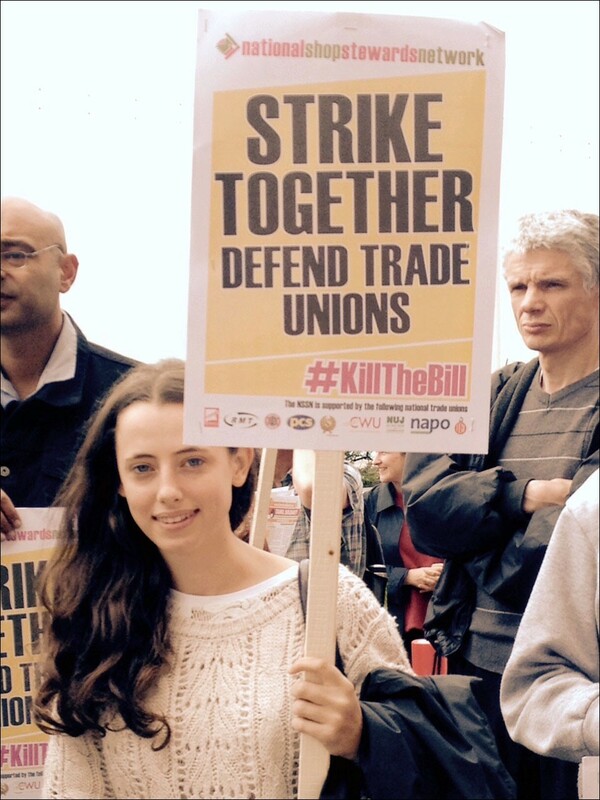 At its rally at TUC congress last September, the NSSN called on the TUC and the unions to call a demonstration on the theme of breaking the Tory pay cap, which had the potential to be massive and could then have opened the way to strike action across the public sector. Instead, the union leaders called it six months too late, when most of the different public sector pay claims had been settled separately and the mood dissipated. Nonetheless, the fact that the Tories have lifted the 1% pay cap in the NHS and local government, while still below inflation, is a sign of their weakness and their fear of the angry mood that is building up. They found £4.2 billion for the NHS pay deal alone, showing just a glimpse of what could be won if real pressure was applied. This is reflected in a number of bitter disputes that have been breaking out, often on a localised scale. The RMT has been taking strike action for over two years against driver-only operation, for example. Interestingly, while the number of days lost to strikes has declined, there appears to be a move away from periodic one-day stoppages towards more sustained action. 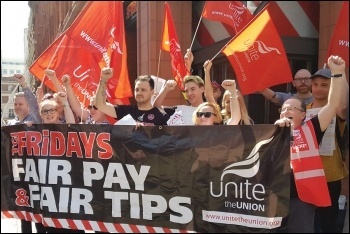 This is in part due to an unintended consequence of one section of the Trade Union Act in timing out disputes after six months, so encouraging workers to escalate the action quicker. It is also because workers have come to understand that this type of action has not been enough to build action and win victories. This was a major factor in the UCU pensions strikes, when members took 14 days of action in a month and forced back the employers, rebelling against the union's leadership who wanted to agree a resolution. That dispute, along with the Communication Workers Union in Royal Mail, disproved the theory that national strike ballots couldn't be won. NSSN conference will meet in the middle of PCS's national strike ballot on pay as the Tories look to maintain the pay ceiling in the civil service. The whole of the union movement must get behind PCS, which has long been a target for the Tories because of its role in building the N30 strike. The NSSN will stand shoulder to shoulder with PCS in winning their ballot with sufficient turnout and then for the action that will be needed to win their pay claim. Such a victory over the Tories could give many other workers the confidence that it's possible to fight and win. The potential for rebuilding the trade unions is enormous. There have been significant struggles over the last few years by workers who are in traditionally trade union-organised workplaces, but also new, younger groups of workers organising action. From junior doctors to Deliveroo drivers, these disputes show that mass, national, coordinated action is inherent in the current situation. If a leadership up to the task can be built, such action can bring down the weak and divided Tories. NHS at 70: a fight for our lives! Issue 1000 extra 1,000 sales target smashed! No to sexism! No to Trump!